In a food processor, blend sugar, salt and flour. Cut butter into small pieces and blend quickly into dry mix to a coarse texture. Add zest and cream, blend briefly. Turn the dough onto a floured surface and pat into a round disk. Wrap and chill slightly. Return to board and roll into a circle to fit the tart pan. Lay the dough in the pan, carefully pushing the dough up the side. Dough will shrink slightly and pull to the bottom, so this step is very important. Trim excess dough. Chill for 1 hour. Bake blind at 350°F for about 30 minutes. Cool before filling. Whip the cream to soft peaks. Cover and chill. Blend beaten eggs, sugar, lime juice in a stainless steel bowl. Cook over boiling water, stirring constantly until curd thickens. Remove from heat and fold in the chocolate until melted. Cool. Fold cream into curd. Fill baked tart shell. Chill before garnishing. Wash, dry, de-stem and cut strawberries in quarters. Peel and slice kiwi in half rounds. Wash other berries. 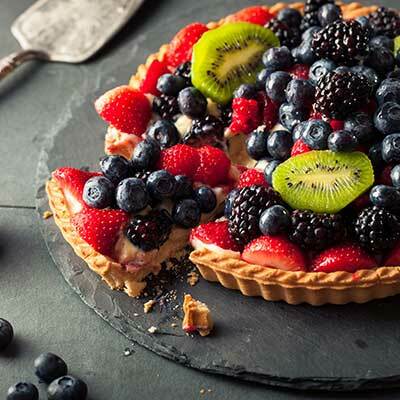 Arrange fruit on top of set tart. Brush lightly with apricot glaze. Garnish edges or center with haystack style chocolate shavings. To serve, remove outer ring. Slice, carefully sliding spatula under crust to remove.